This article is about the international environmental organization. For other uses, see Greenpeace (disambiguation). See article for more details on formation. Greenpeace is a non-governmental environmental organization with offices in over 39 countries and an international coordinating body in Amsterdam, the Netherlands. Greenpeace was founded in 1971 by Irving Stowe, and Dorothy Stowe, Canadian and US ex-pat environmental activists. Greenpeace states its goal is to "ensure the ability of the Earth to nurture life in all its diversity" and focuses its campaigning on worldwide issues such as climate change, deforestation, overfishing, commercial whaling, genetic engineering, and anti-nuclear issues. It uses direct action, lobbying, research, and ecotage to achieve its goals. The global organization does not accept funding from governments, corporations, or political parties, relying on three million individual supporters and foundation grants. Greenpeace has a general consultative status with the United Nations Economic and Social Council and is a founding member of the INGO Accountability Charter, an international non-governmental organization that intends to foster accountability and transparency of non-governmental organizations. Greenpeace is known for its direct actions and has been described as the most visible environmental organization in the world. Greenpeace has raised environmental issues to public knowledge, and influenced both the private and the public sector. Greenpeace has also been a source of controversy; its motives and methods (some of the latter being illegal) have received criticism, including an open letter from more than 100 Nobel laureates urging Greenpeace to end its campaign against genetically modified organisms (GMOs). The organization's direct actions have sparked legal actions against Greenpeace activists, such as fines and suspended sentences for destroying a test plot of genetically modified wheat and damaging the Nazca Lines, a UN World Heritage site in Peru. 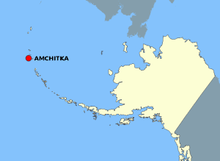 Location of Amchitka island in Alaska. In the late 1960s, the U.S. had plans for an underground nuclear weapon test in the tectonically unstable island of Amchitka in Alaska. Because of the 1964 Alaska earthquake, the plans raised some concerns of the test triggering earthquakes and causing a tsunami. A 1969 demonstration of 7,000 people blocked the Peace Arch Border Crossing between British Columbia and Washington, carrying signs reading "Don't Make A Wave. It's Your Fault If Our Fault Goes". The protests did not stop the U.S. from detonating the bomb. While no earthquake or tsunami followed the test, the opposition grew when the U.S. announced they would detonate a bomb five times more powerful than the first one. Among the opposers were Jim Bohlen, a veteran who had served in the U.S. Navy, and Irving Stowe and Dorothy Stowe, who had recently become Quakers. As members of the Sierra Club Canada, they were frustrated by the lack of action by the organization. From Irving Stowe, Jim Bohlen learned of a form of passive resistance, "bearing witness", where objectionable activity is protested simply by mere presence. Jim Bohlen's wife Marie came up with the idea to sail to Amchitka, inspired by the anti-nuclear voyages of Albert Bigelow in 1958. The idea ended up in the press and was linked to The Sierra Club. The Sierra Club did not like this connection and in 1970 The Don't Make a Wave Committee was established for the protest. Early meetings were held in the Shaughnessy home of Robert Hunter and his wife Bobbi Hunter. Subsequently, the Stowe home at 2775 Courtenay Street (Vancouver) became the headquarters. As Rex Weyler put it in his chronology, Greenpeace, in 1969, Irving and Dorothy Stowe's "quiet home on Courtenay Street would soon become a hub of monumental, global significance". Some of the first Greenpeace meetings were held there. The first office was opened in a backroom, storefront on Cypress and West Broadway SE corner in Kitsilano, Vancouver. Within half a year Greenpeace would move in to share the upstairs office space with The Society Promoting Environmental Conservation at 4th and Maple in Kitsilano. Irving Stowe arranged a benefit concert (supported by Joan Baez) that took place on October 16, 1970 at the Pacific Coliseum in Vancouver. The concert created the financial basis for the first Greenpeace campaign. Amchitka, the 1970 concert that launched Greenpeace was published by Greenpeace in November 2009 on CD and is also available as an mp3 download via the Amchitka concert website. Using the money raised with the concert, the Don't Make a Wave Committee chartered a ship, the Phyllis Cormack owned and sailed by John Cormack. The ship was renamed Greenpeace for the protest after a term coined by activist Bill Darnell. In the autumn of 1971, the ship sailed towards Amchitka and faced the U.S. Coast Guard ship Confidence which forced the activists to turn back. Because of this and the increasingly bad weather the crew decided to return to Canada only to find out that the news about their journey and reported support from the crew of the Confidence had generated sympathy for their protest. After this Greenpeace tried to navigate to the test site with other vessels, until the U.S. detonated the bomb. The nuclear test was criticized and the U.S. decided not to continue with their test plans at Amchitka. Environmental historian Frank Zelko dates the formation of the "Don't Make a Wave Committee" to 1969 and according to Jim Bohlen the group adopted the name "Don't Make a Wave Committee" on 28 November 1969. According to the Greenpeace web site, The Don't Make a Wave Committee was established in 1970. Certificate of incorporation of The Don't Make a Wave Committee dates the incorporation to the fifth of October, 1970. Researcher Vanessa Timmer dates the official incorporation to 1971. Greenpeace itself calls the protest voyage of 1971 as "the beginning". According to Patrick Moore, who was an early member and has since distanced himself from Greenpeace, and Rex Weyler, the name of "The Don't Make a Wave Committee" was officially changed to Greenpeace Foundation in 1972. Vanessa Timmer has referred to the early members as "an unlikely group of loosely organized protestors". Frank Zelko has commented that "unlike Friends of the Earth, for example, which sprung fully formed from the forehead of David Brower, Greenpeace developed in a more evolutionary manner. There was no single founder". Greenpeace itself says on its web page that "there's a joke that in any bar in Vancouver, British Columbia, you can sit down next to someone who claims to have founded Greenpeace. In fact, there was no single founder: name, idea, spirit and tactics can all be said to have separate lineages". Patrick Moore has said that "the truth is that Greenpeace was always a work in progress, not something definitively founded like a country or a company. Therefore there are a few shades of gray about who might lay claim to being a founder of Greenpeace." Early Greenpeace director Rex Weyler says on his homepage that the insiders of Greenpeace have debated about the founders since the mid-1970s. The current Greenpeace web site lists the founders of The Don't Make a Wave Committee as Dorothy and Irving Stowe, Marie and Jim Bohlen, Ben and Dorothy Metcalfe, and Robert Hunter. According to both Patrick Moore and an interview with Dorothy Stowe, Dorothy Metcalfe, Jim Bohlen and Robert Hunter, the founders of The Don't Make a Wave Committee were Paul Cote, Irving and Dorothy Stowe and Jim and Marie Bohlen. Paul Watson, founder of the Sea Shepherd Conservation Society maintains that he also was one of the founders of The Don't Make a Wave Committee and Greenpeace. Media sources concerning Watson report him being one of the founders of Greenpeace, with many articles reporting him being a founder in 1972. Patrick Moore has denied Watson being one of the founders of The Don't Make a Wave Committee, and Greenpeace in 1972. According to Moore the already campaigning organization was "simply changing the name" in 1972. Greenpeace has stated that Watson was an influential early member, but not one of the founders of Greenpeace. Watson has since accused Greenpeace of rewriting their history. Because Patrick Moore was among the crew of the first protest voyage and the beginning of the journey is often referred as the birthday of Greenpeace, Moore also considers himself one of the founders. Greenpeace used to list Moore among "founders and first members" but has later stated that while Moore was a significant early member, he was not among the founders of Greenpeace in 1970. After the office in the Stowe home, (and after the first concert fund-raiser) Greenpeace functions moved to other private homes and held public meetings weekly on Wednesday nights at the Kitsilano Neighborhood House before settling, in the autumn of 1974, in a small office shared with the SPEC environmental group at 2007 West 4th at Maple in Kitsilano. When the nuclear tests at Amchitka were over, Greenpeace moved its focus to the French atmospheric nuclear weapons testing at the Moruroa Atoll in French Polynesia. The young organization needed help for their protests and were contacted by David McTaggart, a former businessman living in New Zealand. In 1972 the yacht Vega, a 12.5-metre (41 ft) ketch owned by David McTaggart, was renamed Greenpeace III and sailed in an anti-nuclear protest into the exclusion zone at Moruroa to attempt to disrupt French nuclear testing. This voyage was sponsored and organized by the New Zealand branch of the Campaign for Nuclear Disarmament. The French Navy tried to stop the protest in several ways, including assaulting David McTaggart. McTaggart was supposedly beaten to the point that he lost sight in one of his eyes. However, one of McTaggart's crew members photographed the incident and went public. After the assault was publicized, France announced it would stop the atmospheric nuclear tests. In the mid-1970s some Greenpeace members started an independent campaign, Project Ahab, against commercial whaling, since Irving Stowe was against Greenpeace focusing on other issues than nuclear weapons. After Irving Stowe died in 1975, the Phyllis Cormack sailed from Vancouver to face Soviet whalers on the coast of California. Greenpeace activists disrupted the whaling by placing themselves between the harpoons and the whales, and footage of the protests spread across the world. Later in the 1970s, the organization widened its focus to include toxic waste and commercial seal hunting. The "Greenpeace Declaration of Interdependence" was published by Greenpeace in the Greenpeace Chronicles (Winter 1976-77). This declaration was a condensation of a number of ecological manifestos Bob Hunter had written over the years. Greenpeace evolved from a group of Canadian and American protesters into a less conservative group of environmentalists who were more reflective of the counterculture and hippie youth movements of the 1960s and 1970s. The social and cultural background from which Greenpeace emerged heralded a period of de-conditioning away from Old World antecedents and sought to develop new codes of social, environmental and political behavior. In the mid-1970s independent groups using the name Greenpeace started springing up worldwide. By 1977, there were 15 to 20 Greenpeace groups around the world. At the same time the Canadian Greenpeace office was heavily in debt. Disputes between offices over fund-raising and organizational direction split the global movement as the North American offices were reluctant to be under the authority of the Vancouver office and its president Patrick Moore. After the incidents of Moruroa Atoll, David McTaggart had moved to France to battle in court with the French state and helped to develop the cooperation of European Greenpeace groups. David McTaggart lobbied the Canadian Greenpeace Foundation to accept a new structure which would bring the scattered Greenpeace offices under the auspices of a single global organization. The European Greenpeace paid the debt of the Canadian Greenpeace office and on October 14, 1979, Greenpeace International came into existence. Under the new structure, the local offices would contribute a percentage of their income to the international organization, which would take responsibility for setting the overall direction of the movement with each regional office having one vote. Some Greenpeace groups, namely London Greenpeace (dissolved in 2001) and the US-based Greenpeace Foundation (still operational) however decided to remain independent from Greenpeace International. 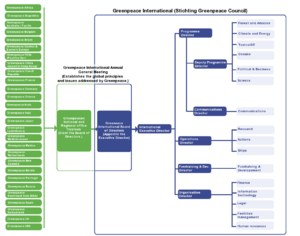 The governance and management structure of Greenpeace. Greenpeace consists of Greenpeace International (officially Stichting Greenpeace Council) based in Amsterdam, Netherlands, and 26 regional offices operating in 55 countries. The regional offices work largely autonomously under the supervision of Greenpeace International. The executive director of Greenpeace is elected by the board members of Greenpeace International. The current directors of Greenpeace International are Bunny McDiarmid and Jennifer Morgan and the current Chair of the Board is Ana Toni. Greenpeace has a staff of 2,400 and 15,000 volunteers globally. Each regional office is led by a regional executive director elected by the regional board of directors. The regional boards also appoint a trustee to The Greenpeace International Annual General Meeting, where the trustees elect or remove the board of directors of Greenpeace International. The role of the annual general meeting is also to discuss and decide the overall principles and strategically important issues for Greenpeace in collaboration with the trustees of regional offices and Greenpeace International board of directors. Donations from foundations which are funded by political parties or receive most of their funding from governments or intergovernmental organizations are rejected. Foundation donations are also rejected if the foundations attach unreasonable conditions, restrictions or constraints on Greenpeace activities or if the donation would compromise the independence and aims of Greenpeace. Since in the mid-1990s the number of supporters started to decrease, Greenpeace pioneered the use of face-to-face fundraising where fundraisers actively seek new supporters at public places, subscribing them for a monthly direct debit donation. In 2008, most of the €202.5 million received by the organization was donated by about 2.6 million regular supporters, mainly from Europe. In 2014, the annual revenue of Greenpeace was reported to be about €300 million (US$400 million) although they lost about €4 million (US$5 million) in currency speculation that year. Greenpeace street fundraiser talking to a passer-by. In September 2003, Public Interest Watch (PIW) complained to the Internal Revenue Service that Greenpeace USA tax returns were inaccurate and in violation of the law. The IRS conducted an extensive review and concluded in December 2005 that Greenpeace USA continued to qualify for its tax-exempt status. In March 2006 The Wall Street Journal reported that PIW's "federal tax filing, covering August 2003 to July 2004, stated that $120,000 of the $124,095 the group received in contributions during that period came from Exxon Mobil". In 2013, after the IRS performed a follow-up audit, which again was clean, and, following claims of politically motivated IRS audits of groups affiliated with the Tea Party Movement, Greenpeace U.S. Executive Director Phil Radford called for a Congressional investigation into all politically motivated audits – including those allegedly targeting the Tea Party Movement, the NAACP, and Greenpeace. - Stop the planet from warming beyond 1.5º to prevent the most catastrophic impacts of the climate breakdown. - Protect biodiversity in all its forms. - Slow the volume of hyper-consumption and learn to live within our means. - Promote renewable energy as a solution that can power the world. - Nurture peace, global disarmament and non-violence. Greenpeace was one of the first parties to formulate a sustainable development scenario for climate change mitigation, which it did in 1993. According to sociologists Marc Mormont and Christine Dasnoy, Greenpeace played a significant role in raising public awareness of global warming in the 1990s. The organization has also focused on CFCs, because of both their global warming potential and their effect on the ozone layer. Greenpeace was one of the leading participants advocating early phase-out of ozone depleting substances in the Montreal Protocol. In the early 1990s, Greenpeace developed a CFC-free refrigerator technology, "Greenfreeze" for mass production together with the refrigerator industry. United Nations Environment Programme awarded Greenpeace for "outstanding contributions to the protection of the Earth's ozone layer" in 1997. In 2011 two fifths of the world's total production of refrigerators were based on Greenfreeze technology, with over 600 million units in use. Currently Greenpeace considers global warming to be the greatest environmental problem facing the Earth. Greenpeace calls for global greenhouse gas emissions to peak in 2015 and to decrease as close to zero as possible by 2050. To reach these numbers, Greenpeace has called for the industrialized countries to cut their emissions at least 40% by 2020 (from 1990 levels) and to give substantial funding for developing countries to build a sustainable energy capacity, to adapt to the inevitable consequences of global warming, and to stop deforestation by 2020. Together with EREC, Greenpeace has formulated a global energy scenario, "Energy [R]evolution", where 80% of the world's total energy is produced with renewables, and the emissions of the energy sector are decreased by over 80% of the 1990 levels by 2050. Using direct action, Greenpeace has protested several times against coal by occupying coal power plants and blocking coal shipments and mining operations, in places such as New Zealand, Svalbard, Australia, and the United Kingdom. Greenpeace is also critical of extracting petroleum from oil sands and has used direct action to block operations at the Athabasca oil sands in Canada. In October 2007, six Greenpeace protesters were arrested for breaking into the Kingsnorth power station, climbing the 200 metre smokestack, painting the name Gordon on the chimney, and causing an estimated £30,000 damage. At their subsequent trial they admitted trying to shut the station down, but argued that they were legally justified because they were trying to prevent climate change from causing greater damage to property elsewhere around the world. Evidence was heard from David Cameron's environment adviser Zac Goldsmith, climate scientist James E. Hansen and an Inuit leader from Greenland, all saying that climate change was already seriously affecting life around the world. The six activists were acquitted. It was the first case where preventing property damage caused by climate change has been used as part of a "lawful excuse" defense in court. Both The Daily Telegraph and The Guardian described the acquittal as embarrassment to the Brown Ministry. In December 2008 The New York Times listed the acquittal in its annual list of the most influential ideas of the year. As part of their stance on renewable energy commercialisation, Greenpeace have launched the "Go Beyond Oil" campaign. The campaign is focused on slowing, and eventually ending, the world's consumption of oil; with activist activities taking place against companies that pursue oil drilling as a venture. Much of the activities of the "Go Beyond Oil" campaign have been focused on drilling for oil in the Arctic and areas affected by the Deepwater Horizon disaster. The activities of Greenpeace in the arctic have mainly involved the Edinburgh-based oil and gas exploration company, Cairn Energy; and range from protests at the Cairn Energy's headquarters to scaling their oil rigs in an attempt to halt the drilling process. The "Go Beyond Oil" campaign also involves applying political pressure on the governments who allow oil exploration in their territories; with the group stating that one of the key aims of the "Go Beyond Oil" campaign is to "work to expose the lengths the oil industry is willing to go to squeeze the last barrels out of the ground and put pressure on industry and governments to move beyond oil." Greenpeace is opposed to nuclear power because it views it as 'dangerous, polluting, expensive and non-renewable'. The organization highlights the Chernobyl nuclear disaster of 1986 and Fukushima nuclear disaster of 2011 as evidence of the risk nuclear power can pose to peoples lives, the environment and the economy. Greenpeace views the benefits of nuclear power to be relatively minor in comparison to its major problems and risks, such as environmental damage and risks from uranium mining, nuclear weapons proliferation, and unresolved questions concerning nuclear waste. The organization argues that the potential of nuclear power to mitigate global warming is marginal, referring to the IEA energy scenario where an increase in world's nuclear capacity from 2608 TWh in 2007 to 9857 TWh by 2050 would cut global greenhouse gas emissions less than 5% and require 32 nuclear reactor units of 1000MW capacity built per year until 2050. According to Greenpeace the slow construction times, construction delays, and hidden costs, all negate the mitigation potential of nuclear power. This makes the IEA scenario technically and financially unrealistic. They also argue that binding massive amounts of investments on nuclear energy would take funding away from more effective solutions. Greenpeace views the construction of Olkiluoto 3 nuclear power plant in Finland as an example of the problems on building new nuclear power. In 1994, Greenpeace published an anti-nuclear newspaper advert which included a claim that nuclear facilities Sellafield would kill 2,000 people in the next 10 years, and an image of a hydrocephalus-affected child said to be a victim of nuclear weapons testing in Kazakhstan. Advertising Standards Authority viewed the claim concerning Sellafield as unsubstantiated, and ASA did not accept that the child's condition was caused by radiation. This resulted in the banning of the advert. Greenpeace did not admit fault, stating that a Kazakhstan doctor had said that the child's condition was due to nuclear testing. Adam Woolf from Greenpeace also stated that, "fifty years ago there were many experts who would be lined up and swear there was no link between smoking and bad health." The UN has estimated that the nuclear weapon tests in Kazakhstan caused about 100,000 people to suffer over three generations. In 2011, a French court fined Électricité de France (EDF) €1.5m and jailed two senior employees for spying on Greenpeace, including hacking into Greenpeace's computer systems. Greenpeace was awarded €500,000 in damages. Although EDF claimed that a security firm had only been employed to monitor Greenpeace, the court disagreed, jailing the head and deputy head of EDF's nuclear security operation for three years each. EDF appealed the conviction, the company was cleared of conspiracy to spy on Greenpeace and the fine was cancelled. Two employees of the security firm, Kargus, run by a former member of France's secret services, received sentences of three and two years respectively. In May 2009, Greenpeace started evaluating IT companies through Cool IT Leaderboard. The central role these companies are playing gives the opportunity to drive changes in the energy sector and achieve a significant reduction in the greenhouse gases that cause the climate change. The Leaderboard examines how the leading IT companies can use their influence to drive these changes, which in the 6th edition the sector shows slow but steady improvements in offering new solution that may achieve important progress. There are companies willing to make major investments to drive clean energy deployment and the number of companies that are increasing their commitment, betting for renewable energies, is also growing. Big companies such as Google, Wipro, Sprint and Softbank have prioritized changing the laws and policies that govern the energy system and incentivise investments in advanced energy efficiency technologies and renewable energy that will have a critical impact in many countries to determine a meaningful break in energy policies. In the Leaderboard we can find one main ranking with the overall scores and another three rankings for each one of the evaluated areas where we can find the top companies contributing in each. The Ozone layers surrounding the Earth absorb significant amounts of ultraviolet radiation. A 1976 report by the US Academy of Sciences supported the ozone "depletion hypothesis." Its suffering large losses from chlorinated and nitrogenous compounds was reported in 1985. Earlier studies had led some countries to enact bans on aerosol sprays, so that the Vienna Convention was signed in 1985 the Montreal Protocol was signed in 1987 to go in force two years later. The use of CFCs and HCFCs in refrigeration were and are among the banned technologies. A German technological institute developed an ozone-safe hydrocarbon alternative refrigerant which came to a Greenpeace campaigner's attention in around 1992. The rights to the technology were donated to Greenpeace, which maintained it as an open source patent. With industry resistance, Greenpeace was able to rescue and engage a former East German manufacturer near closure. Greenpeace's resourceful outreach and marketing resulted in the technologies rapid widespread production in Germany, followed by the banning of CFC technology. They then succeeded in getting Greenfreeze used in China and elsewhere in Europe, and after some years in Japan and South America, and finally in the US by 2012. Greenpeace aims to protect intact primary forests from deforestation and degradation with the target of zero deforestation by 2020. Greenpeace has accused several corporations, such as Unilever, Nike, KFC, Kit Kat and McDonald's of having links to the deforestation of the tropical rainforests, resulting in policy changes in several of the companies under criticism. Greenpeace, together with other environmental NGOs, also campaigned for ten years for the EU to ban import of illegal timber. The EU decided to ban illegal timber in July 2010. As deforestation contributes to global warming, Greenpeace has demanded that REDD (Reduced Emission from Deforestation and Forest Degradation) should be included in the climate treaty following the Kyoto treaty. Another Greenpeace movement concerning the rain forests is discouraging palm oil industries. The movement has been the most active in Indonesia where already 6 million hectares are used for palm oil plantation and has plans for another 4 million hectares by 2015. Acknowledging that mass production of palm oil may be disastrous on biodiversity of forests, Greenpeace is actively campaigning against the production, urging the industries and the government to turn to other forms of energy resources. One of the positive results of the campaign was GAR(Golden Agri-Resources), the world's second largest palm oil production company, deciding to commit itself to forest conservation. The company signed an agreement which prevents them from developing plantations in areas where large amounts of carbon are locked up. On the promotional side, an example of Greenpeace's success in the area is a viral video from 2016 protesting Nestlé's use of palm oil in Kit Kat bars. The video received over 1 million views, and resulted in a public statement by Nestlé claiming to no longer use such practices in their products. In 2018, Greenpeace released an animated short starring a fictional orangutan named Rang-tan ahead of the World Orangutan Day. In November 2018, UK's Clearcast have denied a version of Rang-tan video as submitted by Iceland Foods Ltd. In June 1995, Greenpeace took a trunk of a tree from the forests of the proposed national park of Koitajoki in Ilomantsi, Finland and put it on display at exhibitions held in Austria and Germany. Greenpeace said in a press conference that the tree was originally from a logged area in the ancient forest which was supposed to be protected. Metsähallitus accused Greenpeace of theft and said that the tree was from a normal forest and had been left standing because of its old age. Metsähallitus also said that the tree had actually crashed over a road during a storm. The incident received publicity in Finland, for example in the large newspapers Helsingin Sanomat and Ilta-Sanomat. Greenpeace replied that the tree had fallen down because the protective forest around it had been clearcut, and that they wanted to highlight the fate of old forests in general, not the fate of one particular tree. Greenpeace also highlighted that Metsähallitus admitted the value of the forest afterwards as Metsähallitus currently refers to Koitajoki as a distinctive area because of its old growth forests. Until now, Wilmar’s executives have only denied the accusation labeling them as “false” and are not taking any blame on them. The debate reminds unsolved. In 2008, two Greenpeace anti-whaling activists, Junichi Sato and Toru Suzuki, stole a case of whale meat from a delivery depot in Aomori prefecture, Japan. Their intention was to expose what they considered embezzlement of the meat collected during whale hunts. After a brief investigation of their allegations was ended, Sato and Suzuki were arrested and charged with theft and trespassing. Amnesty International said that the arrests and following raids on Greenpeace Japan office and homes of five of Greenpeace staff members were aimed at intimidating activists and non-governmental organizations. They were convicted of theft and trespass in September 2010 by the Aomori district court. Greenpeace has also supported the rejection of GM food from the US in famine-stricken Zambia as long as supplies of non-genetically engineered grain exist, stating that the US "should follow in the European Union's footsteps and allow aid recipients to choose their food aid, buying it locally if they wish. This practice can stimulate developing economies and creates more robust food security", adding that, "if Africans truly have no other alternative, the controversial GE maize should be milled so it can't be planted. It was this condition that allowed Zambia's neighbours Zimbabwe and Malawi to accept it." After Zambia banned all GM food aid, the former agricultural minister of Zambia criticized, "how the various international NGOs that have spoken approvingly of the government's action will square the body count with their various consciences." Concerning the decision of Zambia, Greenpeace has stated that, "it was obvious to us that if no non-GM aid was being offered then they should absolutely accept GM food aid. But the Zambian government decided to refuse the GM food. We offered our opinion to the Zambian government and, as many governments do, they disregarded our advice." Greenpeace opposes the planned use of golden rice, a variety of Oryza sativa rice produced through genetic engineering to biosynthesize beta-carotene, a precursor of pro-vitamin A in the edible parts of rice. The addition of beta-carotene to the rice is seen as preventative to loss of sight in poverty stricken countries where golden rice is intended for distribution. According to Greenpeace, golden rice has not managed to do anything about malnutrition for 10 years during which alternative methods are already tackling malnutrition. The alternative proposed by Greenpeace is to discourage mono-cropping and to increase production of crops which are naturally nutrient-rich (containing other nutrients not found in golden rice in addition to beta-carotene). Greenpeace argues that resources should be spent on programs that are already working and helping to relieve malnutrition. The renewal of these concerns coincided with the publication of a paper in the journal Nature about a version of golden rice with much higher levels of beta carotene. This "golden rice 2" was developed and patented by Syngenta, which provoked Greenpeace to renew its allegation that the project is driven by profit motives and to serve as propaganda aimed at increasing public opinion of GMO products. Although Greenpeace had stated that the true efficiency of the golden rice program in treating malnourished populations was its primary concern as early as 2001, statements from March and April 2005 also continued to express concern over human health and environmental safety. In particular, Greenpeace has expressed concern over the lack of safety testing being done on GMO crops such as golden rice and of "playing with the lives of people...using Golden Rice to promote more GMOs". In June 2016, a conglomeration of 107 Nobel Laureates signed an open letter urging Greenpeace to end its campaign against genetically modified crops and Golden Rice in particular. In the letter, they also called upon governments of the world to "do everything in their power to oppose Greenpeace's actions and accelerate the access of farmers to all the tools of modern biology, especially seeds improved through biotechnology." The letter states that "Opposition based on emotion and dogma contradicted by data must be stopped." Greenpeace responded stating that "Accusations that anyone is blocking genetically engineered 'Golden' rice are false" and that they support "...investing in climate-resilient ecological agriculture and empowering farmers to access a balanced and nutritious diet, rather than pouring money down the drain for GE 'Golden' rice." In July 2011, Greenpeace released its Dirty Laundry report accusing some of the world's top fashion and sportswear brands of releasing toxic waste into China's rivers. The report profiles the problem of water pollution resulting from the release of toxic chemicals associated with the country's textile industry. Investigations focused on wastewater discharges from two facilities in China; one belonging to the Youngor Group located on the Yangtze River Delta and the other to Well Dyeing Factory Ltd. located on a tributary of the Pearl River Delta. Scientific analysis of samples from both facilities revealed the presence of hazardous and persistent hormone disruptor chemicals, including alkylphenols, perfluorinated compounds and perfluorooctane sulfonate. The report goes on to assert that the Youngor Group and Well Dyeing Factory Ltd. - the two companies behind the facilities - have commercial relationships with a range of major clothing brands, including Abercrombie & Fitch, Adidas, Bauer Hockey, Calvin Klein, Converse, Cortefiel, H&M, Lacoste, Li Ning, Metersbonwe Group, Nike, Phillips-Van Heusen and Puma AG. In 2013, Greenpeace launched the "Detox Fashion" campaign, which signed up some fashion brands to stop the discharge of toxic chemicals into rivers as a result of the production of their clothes. In August 2006, Greenpeace released the first edition of Guide to Greener Electronics, a magazine where mobile and PC manufacturers were ranked for their green performance, mainly based in the use of toxic materials in their products and e-waste. In November 2011, the criteria were updated, as the industry had progressed since 2006, with the objective to get companies to set goals for greenhouse gas reduction, the use of renewable power up to 100 percent, producing long lasting products free of hazardous substances and increasing sustainable practices. To ensure the transparency of the ranking the companies are assessed based only on their public information. For proving companies' policies and practices, Greenpeace uses chemical testing of products, reports from industry observers, media reports and testing of consumer programs to check if they match with their actions. Since the Guide was released in 2006, along with other similar campaigns has driven numerous improvements, when companies ranked eliminate toxic chemicals from their products and improve their recycling schemes. The last published edition of Guide to Greener Electronics was in 2017. The 2017 version included 17 major IT companies and ranked them on three criteria: energy use, resource consumption and chemical elimination. In continuity of the successful campaign to reach the Antarctic-Environmental Protocol, in 2012 and 2013 protests with "Save the Arctic" banners were started. To stop oil- and gas-drilling, industrial fishing and military operations in the Arctic region completely, a "global sanctuary in the high arctic" was demanded from the World leaders at the UN General Assembly: "We want them to pass a UN resolution expressing international concern for the Arctic." A resolution to protect the very vulnerable wildlife and ecosystem. 30 Arctic Sunrise activists were arrested in the Pechora Sea, 19 September 2013, witnessing oil-drilling and protesting at the Gazprom platform Prirazlomnaya by the Russian Coast Guard. Greenpeace members were originally charged with Piracy, then later downgraded to hooliganism, before being dropped altogether following the passage of an amnesty law by the Russian government. In July 2014, Greenpeace launched a global boycott campaign to persuade Lego to cease producing toys carrying the oil company Shell's logo in response to Shell's plans to drill for oil in the Arctic. Lego's partnership with Shell dates back to the 1960s, although the LEGO company created a fictional oil company called Octan. Octan has appeared in countless sets, computer and console games, can be seen at Legoland parks, and is featured as the corporation headed by the villain President Business in The Lego Movie. There is a conflict over oil rigs in the Arctic Ocean between the Norwegian Government and Greenpeace. In 2013, three activists of Greenpeace got on a Statoil's oil rig, wearing bear suits. According to a spokesman from Greenpeace Russia, they stayed on the rig for about three hours. The activists in bear suits "were escorted" to the shore. Statoil reportedly did not intend to file a suit against them. Greenpeace had argued that Statoil's drilling plans posed a threat to Bear Island, an uninhabited wildlife sanctuary that is home to rare species including polar bears, because an oil spill would be nearly impossible to clean up in the Arctic because of the harsh conditions. Greenpeace regards the petroleum activities of Statoil as "illegal". Statoil denies the Greenpeace statement. According to The Maritime Executive (2014), Statoil says "Statoil respects people's right to make a legal protest, and we feel it is important to have a democratic debate around the oil industry. We have established robust plans for the operation, and feel confident they can be carried out safely and without accidents." On May 27, 2014, Greenpeace's ship, MV Esperanza, took over Transocean Spitsbergen, oil rig of Statoil in the Barents Sea such that it became incapable of operating. After that, the manager of Greenpeace Norway Norway Truls Gulowsen answered a phone interview, stating that "Five protesters left the rig by helicopter last night and three returned to a nearby Greenpeace ship." There were seven more protesters on the rig at the time, but the Norwegian police could not remove them immediately because the rig was a flag of convenience ship registered in the Marshall Islands and thus regarded as a ship in the open sea, as long as it did not begin drilling. On May 29, however, the seven activists from Greenpeace were peacefully captured by Norwegian police on the rig. Soon after, according to Reuters, all the activists were set free without any fine. On May 30, the Norwegian Coast Guard finally towed away Esperanza, though in the morning Greenpeace submitted a plea on which more than 80,000 signatures to the Norwegian Environment Minister Tine Sundtoft in Oslo were written. Norwegian government and police reportedly allowed the coast guard to tow the Greenpeace ship. The Norwegian police stated that Statoil asked Greenpeace to stop preventing its activities, but Greenpeace ignored the warning. The police have stated that Greenpeace's interference with the petroleum activities of Statoil was the contrary to Norwegian law and ordered Greenpeace to leave the Barents Sea site. Statoil said delays to the start of drilling cost the company about $1.26 million per day. According to Reuters, Statoil was slated to begin drilling "three oil wells in the Apollo, Atlantis and Mercury prospects in the Hoop area, [which is] some 300 km away from the mainland [of Norway]" in the summer of 2014. Greenpeace has continued to criticize the big oil company for their "green wash," arguing that Statoil hid the truth that it is doing the risky oil drilling by holding "Lego League" with Lego and distracting people's attention to the company's project, and it also argues that Statoil has to alter its attitude toward environments (Norway's News in English 2014). Since Greenpeace was founded, seagoing ships have played a vital role in its campaigns. Greenpeace's ship MV Arctic Sunrise in the harbour of Helsinki. Rainbow Warrior is the third vessel to bear the name. Launched in 2011, it is sometimes referred to as Rainbow Warrior III. In 1978, Greenpeace launched the original Rainbow Warrior, a 40-metre (130 ft), former fishing trawler named after the book Warriors of the Rainbow, which inspired early activist Robert Hunter on the first voyage to Amchitka. Greenpeace purchased the Rainbow Warrior (originally launched as the Sir William Hardy in 1955) at a cost of £40,000. Volunteers restored and refitted it over a period of four months. First deployed to disrupt the hunt of the Icelandic whaling fleet, the Rainbow Warrior would quickly become a mainstay of Greenpeace campaigns. Between 1978 and 1985, crew members also engaged in direct action against the ocean-dumping of toxic and radioactive waste, the grey seal hunt in Orkney and nuclear testing in the Pacific. In May 1985, the vessel was instrumental for 'Operation Exodus', the evacuation of about 300 Rongelap Atoll islanders whose home had been contaminated with nuclear fallout from a US nuclear test two decades earlier which had never been cleaned up and was still having severe health effects on the locals. Later in 1985 the Rainbow Warrior was to lead a flotilla of protest vessels into the waters surrounding Moruroa atoll, site of French nuclear testing. The sinking of the Rainbow Warrior occurred when the French government secretly bombed the ship in Auckland harbour on orders from François Mitterrand himself. This killed Dutch freelance photographer Fernando Pereira, who thought it was safe to enter the boat to get his photographic material after a first small explosion, but drowned as a result of a second, larger explosion. The attack was a public relations disaster for France after it was quickly exposed by the New Zealand police. The French Government in 1987 agreed to pay New Zealand compensation of NZ$13 million and formally apologised for the bombing. The French Government also paid ₣2.3 million compensation to the family of the photographer. Later, in 2001, when the Institute of Cetacean Research of Japan called Greenpeace "eco-terrorists", Gert Leipold, then Executive Director of Greenpeace, detested the claim, saying "calling non violent protest terrorism insults those who were injured or killed in the attacks of real terrorists, including Fernando Pereira, killed by State terrorism in the 1985 attack on the Rainbow Warrior". Greenpeace's second Rainbow Warrior ship arrives in Bali for the 2007 UN climate conference. In 1989 Greenpeace commissioned a replacement Rainbow Warrior vessel, sometimes referred to as Rainbow Warrior II. It retired from service on 16 August 2011, to be replaced by the third generation vessel. 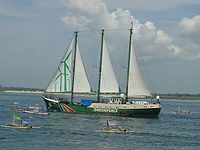 In 2005 the Rainbow Warrior II ran aground on and damaged the Tubbataha Reef in the Philippines while inspecting the reef for coral bleaching. Greenpeace was fined US$7,000 for damaging the reef and agreed to pay the fine saying they felt responsible for the damage, although Greenpeace stated that the Philippines government had given it outdated charts. The park manager of Tubbataha appreciated the quick action Greenpeace took to assess the damage to the reef. Lawsuits have been filed against Greenpeace for lost profits, reputation damage and "sailormongering". In 2004 it was revealed that the Australian government was willing to offer a subsidy to Southern Pacific Petroleum on the condition that the oil company would take legal action against Greenpeace, which had campaigned against the Stuart Oil Shale Project. Some corporations, such as Royal Dutch Shell, BP and Électricité de France have reacted to Greenpeace campaigns by spying on Greenpeace activities and infiltrating Greenpeace offices. Greenpeace activists have also been targets of phone tapping, death threats, violence and even state terrorism in the case of the bombing of the Rainbow Warrior. Canadian ecologist Patrick Moore, an early Greenpeace member, left the organization in 1986 when it, according to Moore, decided to support a universal ban on chlorine in drinking water. Moore has argued that Greenpeace today is motivated by politics rather than science and that none of his "fellow directors had any formal science education". Bruce Cox, Director of Greenpeace Canada, responded that Greenpeace has never demanded a universal chlorine ban and that Greenpeace does not oppose use of chlorine in drinking water or in pharmaceutical uses, adding that "Mr. Moore is alone in his recollection of a fight over chlorine and/or use of science as his reason for leaving Greenpeace." Paul Watson, an early member of Greenpeace has said that Moore "uses his status as a so-called co-founder of Greenpeace to give credibility to his accusations. I am also a co-founder of Greenpeace and I have known Patrick Moore for 35 years.[...] Moore makes accusations that have no basis in fact". More recently Moore has been particularly critical of Greenpeace's stance on golden rice, an issue where Moore has been joined by other environmentalists such as Mark Lynas, claiming that Greenpeace has "waged a campaign of misinformation, trashed the scientists who are working to bring Golden Rice to the people who need it, and supported the violent destruction of Golden Rice field trials." Patrick Moore also reversed his position on nuclear power in 1976, first opposing it and now supporting it. In Australian newspaper The Age, he writes "Greenpeace is wrong—we must consider nuclear power". He argues that any realistic plan to reduce reliance on fossil fuels or greenhouse gas emissions need increased use of nuclear energy. Phil Radford, Executive Director of Greenpeace US responded that nuclear energy is too risky, takes too long to build to address climate change, and claims that most countries, including the U.S., could shift to nearly 100% renewable energy while phasing out nuclear power by 2050. A French journalist under the pen name Olivier Vermont wrote in his book La Face cachée de Greenpeace ("The Hidden Face of Greenpeace") that he had joined Greenpeace France and had worked there as a secretary. According to Vermont he found misconduct, and continued to find it, from Amsterdam to the International office. Vermont said he found classified documents according to which half of the organization's €180 million revenue was used for the organization's salaries and structure. He also accused Greenpeace of having unofficial agreements with polluting companies where the companies paid Greenpeace to keep them from attacking the company's image. Animal protection magazine Animal People reported in March 1997 that Greenpeace France and Greenpeace International had sued Olivier Vermont and his publisher Albin Michel for issuing "defamatory statements, untruths, distortions of the facts and absurd allegations". Writing in Cosmos, journalist Wilson da Silva reacted to Greenpeace's destruction of a genetically modified wheat crop in Ginninderra as another sign that the organization has "lost its way" and had degenerated into a "sad, dogmatic, reactionary phalanx of anti-science zealots who care not for evidence, but for publicity". Research published in natural science journal Nature accused Greenpeace of not caring for facts, when it criticized the dumping of the Brent Spar tanker, and accused the group of exaggerating the volume of oil that was stored in the tanker. Greenpeace had claimed that the tanker contained 5,500 tonnes of crude oil, while Shell estimated it only contained 50 tonnes. However, the measurements had been made under duress during a protest occupation of the platform, since Shell had refused permission, and Greenpeace activists had been under attack by water cannons and the like. The BBC issued an apology to Greenpeace for having reported that the NGO lied. Shell UK took three years to evaluate the disposal options, concluding that the disposal of the tanker in the deep ocean was the "Best Practicable Environmental Option" (BPEO), an option which gained some support within some portion of the scientific community, as it was found by some to be of "negligible" environmental impact. British government and Oslo and Paris Commissions (OSPAR) accepted the solution. The resulting NGO campaign against Shell's proposals included letters, boycotts which even escalated to vandalism in Germany, and lobbying at intergovernmental conferences. Binding moratoriums supporting Greenpeace's, ecosystem protection, and the precautionary principle position were issued in more than one intergovernmental meeting, and at the 1998 OSPAR Convention, WWF presented a study of toxic effects on deep sea ecosystems. The meeting confirmed a general prohibition on ocean dumping. Shell had transported the rig to the dumping site, but in the last hours canceled the operation and announced that it had failed in communicating its plans sufficiently to the public, admitting they had underestimated the strength of public opinion. In January, 1998, Shell issued a new BPEO indicating recycling the rig as a quay in Norway. In 1999, the Brent Spar container was decommissioned and one side issue that emerged was that the legs of the structure were found to contain cold-water coral species (Lophelia pertusa). As a result, the possibility was suggested of keeping the legs of such platforms on the sea bed in future, to serve as habitat. A Greenpeace representative opposed the suggestion, citing the fact that the reefs formed by the coral are at risk, not the coral itself, and that such a move would not promote development of such reefs, and expose coral species to toxic substances found in oil. In 2013 reports noted that Pascal Husting, the director of Greenpeace International's "international programme" was commuting 400km (250 miles) to work by plane, despite Greenpeace's activism to reduce air travel due to carbon footprint. Greenpeace has said "the growth in aviation is ruining our chances of stopping dangerous climate change". After a "public uproar" Greenpeace announced that Husting would commute by train. In December 2014, Greenpeace activists damaged rock related to the Nazca Lines in Peru while setting up a banner within the lines of one of the famed geoglyphs, and there were concerns that the harm might be irreparable. The activists damaged an area around the hummingbird by walking near the glyph without regulation footwear. Access to the area around the lines is strictly prohibited and special shoes must be worn to avoid damaging the UN World Heritage site. Greenpeace claimed the activists were "absolutely careful to protect the Nazca lines," but this is contradicted by video and photographs showing the activists wearing conventional shoes (not special protective shoes) while walking on the site. Greenpeace has apologized to the Peruvian people, but Loise Jamie Castillo, Peru's Vice Minister of Cultural Heritage called the apology "a joke", because Greenpeace refused to identify the vandals or accept responsibility. Culture Minister Diana Álvarez-Calderón said that evidence gathered during an investigation by the government will be used as part of a legal suit against Greenpeace. "The damage done is irreparable and the apologies offered by the environmental group aren't enough," she said at a news conference. By January, 2015, Greenpeace had presented statements of four members of the NGO involved in the action. During the 1990s Greenpeace conducted many anti-whaling expeditions in Norway. The criticism was that Greenpeace only campaigned against whales to gain economic donations from the US economy, and it had little to do with saving the environment. For example, shark hunting is a more pressing issue, but since sharks are widely feared in the United States, activism to help sharks doesn't receive as much financial support. Greenpeace has rejected this claim. However, in Norwegian Newspaper Dagbladet on 11 April 2015 Kumi Naidoo admitted that the anti-whale campaign was a "miscalculation". Greenpeace holds that whaling was only resumed by Norway after the IWC ban because of political election motives, and faces many explicit hurdles, including decreased demand in Japan and toxic chemical contamination. In June 2016, 107 Nobel laureates signed an open letter urging Greenpeace to end its opposition to genetically modified organisms (GMOs). The letter stated: "We urge Greenpeace and its supporters to re-examine the experience of farmers and consumers worldwide with crops and foods improved through biotechnology, recognize the findings of authoritative scientific bodies and regulatory agencies, and abandon their campaign against "GMOs" in general and Golden Rice in particular. Scientific and regulatory agencies around the world have repeatedly and consistently found crops and foods improved through biotechnology to be as safe as, if not safer than those derived from any other method of production. There has never been a single confirmed case of a negative health outcome for humans or animals from their consumption. Their environmental impacts have been shown repeatedly to be less damaging to the environment, and a boon to global biodiversity." The Nobel laureates also called upon governments of the world to "do everything in their power to oppose Greenpeace's actions and accelerate the access of farmers to all the tools of modern biology, especially seeds improved through biotechnology." The letter goes on to say that "Opposition based on emotion and dogma contradicted by data must be stopped." Greenpeace responded stating that "Accusations that anyone is blocking genetically engineered 'Golden' rice are false" and that they support "[...] investing in climate-resilient ecological agriculture and empowering farmers to access a balanced and nutritious diet, rather than pouring money down the drain for GE 'Golden' rice." The Nobel laureate letter was criticised by Silvia Ribeiro of the ETC Group, calling it more of "a propaganda tirade from transgenic companies than scientists presenting a position," and arguing against its claimed benefits. ^ a b "Greenpeace International home page, Get involved". Greenpeace.org. Retrieved 23 November 2012. ^ Liddick, Don (2006). Eco-terrorism: Radical Environmental and Animal Liberation Movements. Greenwood Publishing Group. pp. 16–. ISBN 978-0-275-98535-6. ^ "United Nations, Department of Economic and Social Affairs, NGO Branch". Esango.un.org. 24 February 2010. Retrieved 23 November 2012. ^ Background – January 7, 2010 (7 January 2010). "Greenpeace International: Greenpeace worldwide". Greenpeace.org. Retrieved 21 February 2011. ^ a b c Background – January 8, 2009 (8 January 2009). "Greenpeace International FAQ: Questions about Greenpeace in general". Greenpeace.org. Archived from the original on 11 April 2010. Retrieved 21 February 2011. ^ "Greenpeace Protesters Paint Field of Genetically Altered Soybeans". Associated Press. 10 October 1996. Retrieved 10 October 2016. ^ a b c Sarah Jane Gilbert (8 September 2008). "Harvard Business School, HBS Cases: The Value of Environmental Activists". Hbswk.hbs.edu. Retrieved 21 February 2011. ^ "List of non-governmental organizations in consultative status with the Economic and Social Council as of 1 September 2011" (PDF). Retrieved 23 November 2012. ^ "International Non-Governmental Organisations Accountability Charter: Charter Background". Ingoaccountabilitycharter.org. Archived from the original on 13 May 2013. Retrieved 23 November 2012. ^ Milmo, Cahal (18 February 2009). "The Independent Wednesday, 18 February 2009: Dumped in Africa: Britain's toxic waste". London: Independent.co.uk. Retrieved 21 February 2011. ^ a b c d "UNEP: Our Planet: Celebrating 20 Years of Montreal Protocol" (PDF). Archived from the original (PDF) on 12 October 2007. Retrieved 21 February 2011. ^ Paul Huebener, McMaster University. "Paul Huebener: Greenpeace, ''Globalization and Autonomy Online Compendium''". Globalautonomy.ca. Archived from the original on 10 June 2011. Retrieved 21 February 2011. ^ a b c Moore, Patrick (22 April 2008). "Why I Left Greenpeace". The Wall Street Journal. Retrieved 22 April 2008. ^ "Top Secret: Greenpeace Report Misleading and Incompetent". Roughlydrafted.com. 2 September 2006. Archived from the original on 19 November 2018. Retrieved 21 February 2011. ^ a b c d e "Laureates Letter Supporting Precision Agriculture (GMOs) | Support Precision Agriculture". supportprecisionagriculture.org. Retrieved 30 June 2016. ^ Shaw, Anny (7 January 2010). "Greenpeace activists arrested for gatecrashing royal gala dinner in Copenhagen released from jail". London: The Daily Mail. Retrieved 11 January 2010. ^ "Greenpeace members charged in Mount Rushmore G-8 protest". CNN.com. 7 January 2010. Retrieved 8 July 2009. ^ GMO crops vandalized in Oregon, Karl Haro von Mogel, Biology Fortified, 24 June 2013. ^ "Greenpeace activists in costly GM protest". Sydney Morning Herald. 2 August 2012. Retrieved 8 November 2013. ^ "GM crop destroyers given suspended sentences". Canberra Times. 19 November 2012. Retrieved 8 November 2013. ^ a b c Kozak, Robert (14 December 2014). "Peru Says Greenpeace Permanently Damaged Nazca Lines". The Wall Street Journal. Archived from the original on 21 December 2014. Retrieved 3 February 2015. ^ "Protests fail to stop Nuclear Test countdown", The Free-Lance Star - Oct 2, 1969, Accessed via Google News Archive November 16, 2012. ^ Hawthorn, Tom (30 March 2011). "Tom Hawthorn's blog: For sale: The house where Greenpeace was born". Tomhawthorn.blogspot.com. Retrieved 6 June 2011. ^ Greenpeace to Amchitka, An Environmental Odyssey by Robert Hunter. ^ Dyck, Lloyd H. Dyck (17 October 1970). "Joni nervous at Greenpeace benefit show". Vancouver Sun. 84 (242). Vancouver BC: The Sun Publishing Company. p. 35 – via Newspapers.com. ^ "Frank Zelko: Making Greenpeace: The Development of Direct Action Environmentalism in British Columbia(PDF)". Archived from the original on 12 April 2013. Retrieved 23 November 2012. ^ a b c "Greenpeace Official page: The Founders". Greenpeace.org. 29 October 2008. Retrieved 21 February 2011. ^ a b c d e f "Patrick Moore: Who Are the Founders of Greenpeace". Beatty Street Publishing. Archived from the original on 7 October 2012. Retrieved 22 November 2012. ^ a b c d "Timmer, Vanessa: Agility and Resilence: The Adaptive Capacity of Friends of the Earth International and Greenpeace" (PDF). University of British Columbia. February 2007. Retrieved 19 November 2012. ^ "Greenpeace International: The History of Greenpeace". Greenpeace.org. 14 September 2009. Retrieved 21 February 2011. ^ Rex Weyler. "Chronology, the Founding of Greenpeace". www.rexweyler.com. Archived from the original on 17 October 2013. Retrieved 22 November 2012. ^ Rex Weyler. "Waves of Compassion. The founding of Greenpeace". Utne.com. p. 19. Retrieved 23 November 2012. ^ Rex Weyler. "Who were the Founders?". www.rexweyler.com. Archived from the original on 8 October 2012. Retrieved 22 November 2012. ^ a b "Interview by Michael Friedrich: Greenpeace Founders". Archive.greenpeace.org. Archived from the original on 22 June 2011. Retrieved 21 February 2011. ^ a b "Sea Shepherd Conservation Society: Greenpeace Attempts to Make Captain Paul Watson 'Disappear'". Seashepherd.org. 15 May 2008. Archived from the original on 4 March 2011. Retrieved 21 February 2011. ^ Broder, John M. (6 December 2011). "Greenpeace Leader Visits Boardroom, Without Forsaking Social Activism". www.greenpeace.org. Retrieved 22 November 2012. ^ McDonald, Mark (22 November 2008). "In Battle Against Whaling, Groups Split on Strategy". The New York Times. Retrieved 22 November 2012. ^ Siddique, Haroon (6 January 2010). "Japanese whaling boat clash likely to ignite row over activists' tactics". The Guardian. Retrieved 22 November 2012. ^ Vidal, John (2 January 2002). "Greenpeace fights sea battle with rival anti-whaling ship". The Guardian. London. Retrieved 22 November 2012. ^ "Paul Watson: Sea Shepherd eco-warrior fighting to stop whaling and seal hunts". The Daily Telegraph. London. 17 April 2009. Retrieved 22 November 2012. ^ "Animal Planet, Bios: Captain Paul F. Watson". Animal Planet. Retrieved 22 November 2012. ^ "Greenpeace: Paul Watson, Sea Shepherd and Greenpeace: some facts". Greenpeace. 17 December 2008. Retrieved 22 November 2012. ^ "The Founders". Greenpeace USA. 1 March 2009. Retrieved 12 March 2019. ^ "Patrick Moore background information". Greenpeace.org. 7 December 2010. Retrieved 23 November 2012. ^ Haas, Michael (5 September 2013). International Human Rights: A Comprehensive Introduction. Routledge. ISBN 9781135005788. ^ "Greenpeace". Rex Weyler. 1 March 1954. Archived from the original on 12 June 2011. Retrieved 6 June 2011. ^ a b c d Weyler, Rex. "Waves of Compassion. The founding of Greenpeace". Utne.com. pp. 14–15. Archived from the original on 14 October 2007. Retrieved 23 November 2012. ^ "London Greenpeace – A History of Peace, Protest and Campaigning". McSpotlight. Retrieved 6 June 2011. ^ "About the". Greenpeace Foundation. Archived from the original on 1 August 2012. Retrieved 21 February 2011. ^ Background – November 13, 2008 (13 November 2008). "Greenpeace, organization". Greenpeace.org. Archived from the original on 17 January 2011. Retrieved 3 April 2016. ^ Background – November 16, 2009 (15 January 2016). "Greenpeace International, Executive Director". Greenpeace.org. Retrieved 20 May 2016. ^ Background – June 8, 2009 (21 April 2011). "Greenpeace International, Board of Directors". Greenpeace.org. Archived from the original on 26 April 2008. Retrieved 9 November 2012. ^ "Governance Structure". Greenpeace.org. 11 April 2011. Archived from the original on 6 December 2010. Retrieved 23 November 2012. ^ a b c "Greenpeace Fundraising policies" (PDF). Retrieved 21 February 2011. ^ "Seeing Greenpeace | National Review Online". ^ Stecklow, Steve (21 March 2006). "Did a Group Financed by Exxon Prompt IRS to Audit Greenpeace?". The Wall Street Journal. ^ Phil Radford (17 May 2013). "Philip Radford: An Open Letter to the Congressional Committee Investigating Politically-Motivated IRS Audits". Huffington Post. ^ "IPCC, Climate Change 2007: Working Group III: Mitigation of Climate Change". Ipcc.ch. Archived from the original on 19 November 2018. Retrieved 21 February 2011. ^ "UNEP: The 1997 Ozone Awards". Ozone.unep.org. 16 September 1997. Archived from the original on 12 April 2015. Retrieved 21 February 2011. ^ "Greenfreeze F-Gas Victory! Greener Refrigerators Finally Legal in the U.S." Greenpeace. ^ Background – March 29, 2007 (29 March 2007). "Who we are". Greenpeace. Retrieved 21 February 2011. ^ "Climate activists shut down coal mine in protest against Fonterra". Stock & Land. 23 November 2009. Retrieved 4 January 2010. ^ Moskwa, Wojciech (2 October 2009). "Greenpeace blocks Arctic coal mine in Svalbard". Thomson Reuters. Retrieved 4 January 2010. ^ "BHP Coal Berth Blocked by Greenpeace Ship as Protest Continues". Bloomberg. 6 August 2009. Retrieved 4 January 2010. ^ "Greenpeace protestors scale tower in protest at 'Blair's legacy of fumes'". London: Daily Mail. 2 November 2006. Retrieved 4 January 2010. ^ "Greenpeace activists block giant tar sands mining operation – Message to Obama and Harper: Climate leaders don't buy tar sands". CNW Group. 15 November 2009. Archived from the original on 28 July 2011. Retrieved 4 January 2010. ^ "Greenpeace blocks 2nd Canada oil sands operation". Thomson Reuters. 1 October 2009. Retrieved 4 January 2010. ^ Vidal, John (6 October 2008). "Kingsnorth trial: Coal protesters cleared of criminal damage to chimney". London: The Guardian. Retrieved 4 January 2010. ^ Clover, Charles (11 September 2008). "Greenpeace Kingsnorth trial collapse is embarrassing for Gordon Brown". London: The Daily Telegraph. Retrieved 4 January 2010. ^ Vidal, John (11 September 2008). "Not guilty: the Greenpeace activists who used climate change as a legal defense". London: The Guardian. Retrieved 4 January 2010. ^ Mingle, Jonathan (14 December 2008). "8th annual year in ideas – Climate-Change Defense". New York Times. Retrieved 2 April 2010. ^ a b "Go beyond oil | Greenpeace UK". Greenpeace.org.uk. Archived from the original on 3 November 2013. Retrieved 6 June 2011. ^ "Paula Bear: Where's your spill response plan, Cairn? | Greenpeace UK". Greenpeace.org.uk. 29 May 2011. Archived from the original on 29 May 2011. Retrieved 6 June 2011. ^ "Update from the Arctic pod: 48 hours and going strong! | Greenpeace UK". Greenpeace.org.uk. Archived from the original on 9 June 2011. Retrieved 6 June 2011. ^ Nuclear power is part of the problem. Greenpeace (official website). Published 1 July 2016. Retrieved 5 February 2017. ^ "Nuclear Problems". Greenpeace.org.uk. Retrieved 23 November 2012. ^ "Greenpeace International: 'Nuclear Power: a dangerous waste of time'" (PDF). Retrieved 21 February 2011. ^ Williams, Rhys (7 September 1994). "Greenpeace accused of telling lies in advert". London: The Independent. Retrieved 13 December 2009. ^ "Kazakhstan highlights nuclear test aftermath". BBC News. 30 August 2001. ^ Richard Black (10 November 2011). "EDF fined for spying on Greenpeace nuclear campaign". BBC. Retrieved 11 November 2011. ^ Reuters (6 November 2013). "French court throws out EDF guilty verdict in hacking case". Reuters. Retrieved 27 August 2013. ^ Hanna Gersmann (10 November 2011). "EDF fined €1.5m for spying on Greenpeace". The Guardian. London. Retrieved 11 November 2011. ^ "Cool IT Leaderboard, v6" (PDF). Greenpeace. 6 April 2013. Retrieved 18 November 2015. ^ Halocarbons, effects on stratospheric ozone. Washington, DC. : National Academy of Sciences. 1976. ^ Morrisette, Peter M. (1989). "The Evolution of Policy Responses to Stratospheric Ozone Depletion". Natural Resources Journal. 29: 793–820., http://www.ciesin.org/docs/003-006/003-006.html ;accessed 10/10/2016. ^ "Slaughtering the Amazon". Greenpeace USA. 1 June 2009. Archived from the original on 27 July 2010. Retrieved 23 November 2012. ^ "吃掉亚马逊 | Greenpeace International". Greenpeace.org. 6 April 2006. Archived from the original on 24 April 2010. Retrieved 23 November 2012. ^ "Media: Press Releases:2009:Amazon Leather Policy. 2009-07-22". Nikebiz.com. Archived from the original on 27 September 2011. Retrieved 23 November 2012. ^ "Palm oil | Greenpeace UK". Greenpeace.org.uk. Retrieved 23 November 2012. ^ "Golden-Agri Resources official website". Goldenagri.com.sg. Retrieved 23 November 2012. ^ "Sweet success for Kit Kat campaign: you asked, Nestlé has answered". Greenpeace. Greenpeace 2016. Retrieved 18 March 2017. ^ "World Orangutan Day: Numbers in decline despite Indonesian government's claims" (Press release). Greenpeace International. 17 August 2018. Retrieved 14 November 2018. ^ "Iceland advert" (Press release). Clearcast. 9 November 2018. Retrieved 14 November 2018. ^ "Finland's environmental administration, 1995". Ymparisto.fi. Archived from the original on 12 March 2012. Retrieved 21 February 2011. ^ "Stolen trunk of a tree: references from Iltasanomat. 9.6.1995". Vihreavoima.tripod.com. Retrieved 21 February 2011. ^ "References from Helsingin Sanomat, 1.8.1995". Hs.fi. 8 January 1995. Archived from the original on 11 August 2011. Retrieved 21 February 2011. ^ Häirikkö lintukodossa : Suomen Greenpeace 1989–1998 (vastuullinen julkaisija: Matti Vuori, toimitus: Laura Hakoköngäs, 1998, ISBN 951-97079-3-X). ^ "Metsähallitus: The Nature of Koitajoki (in Finnish)". Luontoon.fi. Archived from the original on 11 August 2007. Retrieved 21 February 2011. ^ "World's largest palm oil trader linked to rainforest destruction twice the size of Paris - Greenpeace International". Greenpeace International. Retrieved 26 September 2018. ^ Georgina Robinson (9 June 2010). "Whaling protesters demand release of Tokyo Two". The Sydney Morning Herald. ^ "Japan must respect rights of detained Greenpeace activists". Amnesty.org. 15 July 2008. Retrieved 23 November 2012. ^ Feature story – September 30, 2002 (30 September 2002). "Eat this or die, The poison politics of food aid". Greenpeace. Retrieved 21 February 2011. ^ Rory, Carrol (30 October 2002). "Zambia slams door shut on GM relief food". The Guardian. London. Retrieved 18 October 2010. ^ "Greenpeace, GM food aid and Zambia". Greenpeace. Archived from the original on 16 December 2010. Retrieved 21 February 2011. ^ Background – November 5, 2010 (5 November 2010). "and golden rice". Greenpeace. Retrieved 21 February 2011. ^ Paine JA, Shipton CA, Chaggar S, Howells RM, Kennedy MJ, Vernon G, Wright SY, Hinchliffe E, Adams JL, Silverstone AL, Drake R (2005) A new version of Golden Rice with increased pro-vitamin A content. Nature Biotechnology 23:482–487. ^ a b Militant Filipino farmers destroy Golden Rice GM crop, New Scientist, 09 August 2013. ^ Greenpeace. Patents on Rice: the Genetic Engineering Hypocrisy Archived 3 December 2008 at the Wayback Machine. 26 April 2005. ^ "Prof. Dr. Ingo Potrykus Addresses Claims of Anti-Biotechnology Activists". Archived from the original on 23 January 2005. Retrieved 2005-01-23. CS1 maint: BOT: original-url status unknown (link). 15 February 2001. ^ Greenpeace. Golden Rice: All glitter, no gold Archived 10 October 2009 at the Wayback Machine. 16 March 2005. ^ "107 Nobel laureates sign letter blasting Greenpeace over GMOs". ^ MacDonald, Fiona. "107 Nobel Laureates just signed a letter slamming Greenpeace over GMOs". ^ a b "Nobel laureates sign letter on Greenpeace 'Golden' rice position - statement". ^ Greenpeace.Dirty Laundry: Unravelling the corporate connections to toxic water pollution in China. ^ "Guide to Greener Electronics" (PDF). Greenpeace. August 2006. Retrieved 18 November 2015. ^ "Guide to Greener Electronics 2017". Greenpeace USA. 2017. ^ "FAQ – The melting Arctic is under threat from oil drilling, industrial fishing and conflict". Greenpeace – Save the Arctic. Archived from the original on 21 September 2013. Retrieved 21 September 2013. ^ "Protest gegen Ölplattform: Russische Grenzschützer entern Greenpeace-Schiff". Spiegel-Online, Christoph Seidler (German). Retrieved 20 September 2013. ^ AP (27 December 2013). "Defiant Greenpeace Activists Return From Russia". Advisories. Retrieved 27 December 2013. ^ Greenpeace's Polar Bears Board Norwegian Oil Rig. RIA Novosti (2013-0410). ^ Offshore Technology.com. (2014-05-30). Norway police arrest Greenpeace activists at Statoil oil rig site. ^ a b Hovland, K. (2014-05-30). Norway Police Order Greenpeace Ship To Leave Statoil Drilling Site, The Wall Street Journal. ^ Norwegian Ministry Rejects Greenpeace Appeal. The Maritime Executive (2014-05-30). ^ Statoil. (2014-06-02). Ministry rejects Greenpeace appeal. ^ Holter, M. (2014-05-28). Statoil Rig Kept Idle in Norway Arctic by Greenpeace Activists. Bloomberg. ^ a b Norway Moves In to Guard Oil Rig From Greenpeace. The New York Times (2014-05-30). ^ Greenpeace: 'We need a new Statoil'. News in English.no (2014-07-10). ^ Vidal, John (18 January 2010). "Greenpeace commissions third Warrior". The New Zealand Herald. Retrieved 2 October 2011. ^ Goldenberg, Suzanne (25 May 2007). "Rainbow Warrior ringleader heads firm selling arms to US government". London: The Guardian. Retrieved 21 January 2010. ^ "Greenpeace Rejects Terrorism Label, 14 December 2001". Archive.greenpeace.org. 14 December 2001. Archived from the original on 10 May 2012. Retrieved 21 February 2011. ^ BBC News. Greenpeace fined for reef damage. 1 November 2005. ^ "Suncor sues Greenpeace over protest". CBC News. 14 October 2009. Archived from the original on 6 August 2010. ^ "Greenpeace sued for Esso logo abuse | Pinsent Masons LLP. 2002-06-27". Out-law.com. 27 June 2002. Retrieved 23 November 2012. ^ "U.S. Suit Against Greenpeace Dismissed". Los Angeles Times. 20 May 2004. Retrieved 4 May 2010. ^ "Howard Government Offered Oil Firm Millions to Sue Greenpeace". Ens-newswire.com. Retrieved 23 November 2012. ^ Campbell, Matthew; Gourlay, Chris (26 April 2009). "French spies targeted UK Greenpeace". London: Times. Retrieved 4 April 2010. ^ "MI6 'Firm' Spied on Green Groups". London: The Sunday Times. 17 June 2001. Archived from the original on 6 April 2010. Retrieved 4 April 2010. ^ "The Rainbow Warrior bombers, the media and the judiciary, Robie, David, 2007" (PDF). Retrieved 21 February 2011. ^ Suter, Keith (2003). Global order and global disorder: globalization and the nation-state. Praeger Publishers. p. 57. ISBN 0-275-97388-3. ^ Baden, John A. "The anti-chlorine chorus is hitting some bum notes". Seattle Times. Archived from the original on 24 July 2011. ^ Watson, Paul (31 July 2005). "Solutions instead of sensationalism". The San Francisco Examiner. Archived from the original on 12 October 2008. ^ Moore, Patrick (1976) Assault on Future Generations, Greenpeace report, pp. 47-49. ^ a b Moore, Patrick (16 April 2006). "Going Nuclear". Washington Post. ^ "Radford, New Greenpeace Boss on Climate Change, Coal, and Nuclear Power". The Wall Street Journal. 14 April 2009. ^ Développement durable : le concept dévoyé qui ne doit plus durer !, from the Author of "La Servitude Climatique". ^ "Animal People, March 1997". Animalpeoplenews.org. Archived from the original on 22 July 2011. Retrieved 21 February 2011. ^ Editorial comment (1995). "Brent Spar, broken spur". Nature. 375 (6534): 708–709. Bibcode:1995Natur.375..708.. doi:10.1038/375708a0. ^ a b c d e Case Study: The Environmental Conflict Surrounding the Decommissioning of Brent Spar, IAEA. The article refers to "Case Study: Brent Spar", Fisheries Research Services, FRS Marine Laboratory, PO Box 101, 375, Victoria Road, Aberdeen. AB11 9DB UK. ^ De LaFayette, Louise "New Developments in the Disposal of Offshore Installations" The International Journal of Marine and Coastal Law, 14:4 1999. ^ "Oil rig home to rare coral". BBC News, Sci/Tech, Oil rig home to rare coral. 8 December 1999. Retrieved 11 February 2007. ^ Gosden, Emily (23 June 2014). "Greenpeace executive flies 250 miles to work". Telegraph.co.uk. London. ^ Adam Vaughan. "Greenpeace losses: leaked documents reveal extent of financial disarray". the Guardian. ^ Davies, Emily (23 June 2014). "Greenpeace chief Pascal Husting commutes by plane - Daily Mail Online". Mail Online. London. ^ "Greenpeace chief travels to the office by aircraft". The Times. ^ "Greenpeace says programme director to stop commuting by plane". reuters.com. 24 June 2014. ^ Adam Vaughan. "Greenpeace executive to commute by train instead of plane". the Guardian. ^ Neuman, William (12 December 2014). "Peru is Indignant After Greenpeace Makes Its Mark on Ancient Site". The New York Times. Retrieved 13 December 2014. ^ Briceno, Franklin (9 December 2014). "Peru Riled by Greenpeace Stunt at Nazca Lines". Retrieved 11 December 2014. ^ "Video of Greenpeace Nazca Lines Protest". Retrieved 13 December 2014. ^ "Greenpeace apologizes for Nazca lines stunt". 10 December 2014. Archived from the original on 16 December 2014. Retrieved 11 December 2014. ^ "Greenpeace Won't Name Activists Linked to Damage". 16 December 2014. Archived from the original on 17 December 2014. ^ "Norges oljeøkonomi bidrar til krig og folkemord, hevder Greenpeace-sjef Kumi Naidoo". Dagbladet. 11 April 2015. ^ "107 Nobel laureates sign letter blasting Greenpeace over GMOs". Washington Post. Retrieved 29 June 2016. ^ "Silvia Ribeiro". ETC Group (AGETC). Retrieved 19 March 2017. Hunter, Robert (2004). The Greenpeace to Amchitka: an environmental odyssey. Arsenal Pulp Press. ISBN 1-55152-178-4. Ostopowich, Melanie (2002). Greenpeace. Weigl Publishers. ISBN 1-59036-020-6. Mulvaney, Kieran; Warford, Mark (1996): Witness: Twenty-Five Years on the Environmental Front Line, Andre Deutsch. Zelko, Frank (2017): Scaling Greenpeace: From Local Activism to Global Governance, in: Historical Social Research 42 (2), 318-342. Wikimedia Commons has media related to Greenpeace. This page was last edited on 24 March 2019, at 02:03 (UTC).